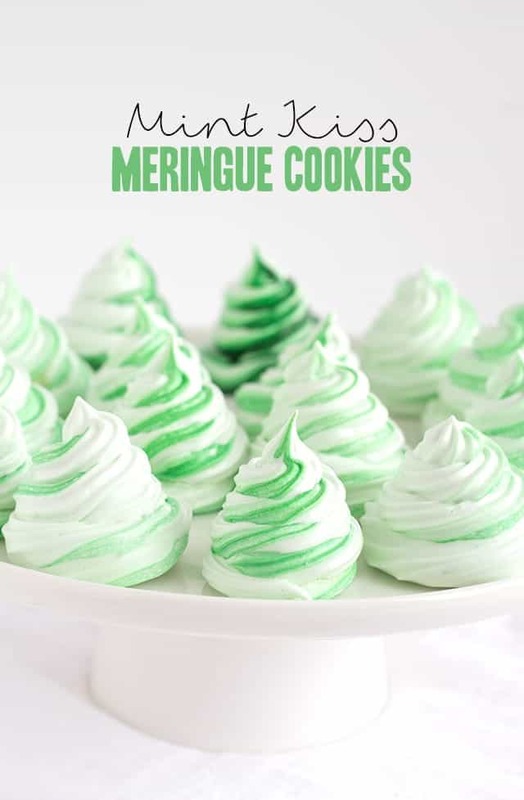 Day 3 of the 12 days of Christmas cookies are these mint kiss meringue cookies. 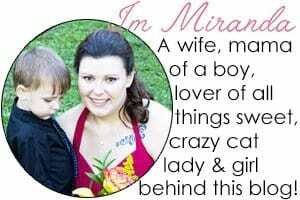 I find myself wanting to say each one if my favorite. If you love mint and chocolate together, these are for you. Yeah, you should probably give them a try even if you don’t care of mint and chocolate together because these rock. Not only are they beautifully festive, but they have a chocolate kiss in the center. Surprise! Little puffs of green gorgeous heaven, guys. Oh hey, if you missed the first two cookies, check out my chocolate drop sugar cookie, and molasses sugar cookie. Preheat oven to 175 degrees. Line a baking sheet with parchment paper. In a mixing bowl, add in the egg whites. Beat on medium/high until the egg whites become glossy. Just after the foam stage. Add in the cream of tartar and beat until soft peaks begin to form. 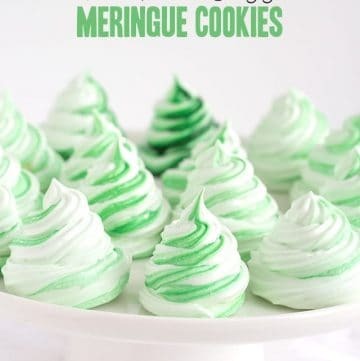 Add in the peppermint extract, 1 drop of green gel paste color and granulated sugar a little at a time as you continue to beat until stiff peaks form. Pull the beater up, and stiff peaks form on the beater and in the mixing bowl, you're ready! Place the wilton 1M tip into a piping bag. Add the remaining 2 drops of green gel paste color into one side of the piping bag. You can use a skewer or knife or spread it all the way down the bag. Fill the bag with the meringue. Pipe 12 flat spirals on the baking sheet. Make sure there's plenty of room to place the chocolate kiss in the center and have an overlap to connect the top half of the tree. Place all of your chocolate kisses in the centers of the spirals. 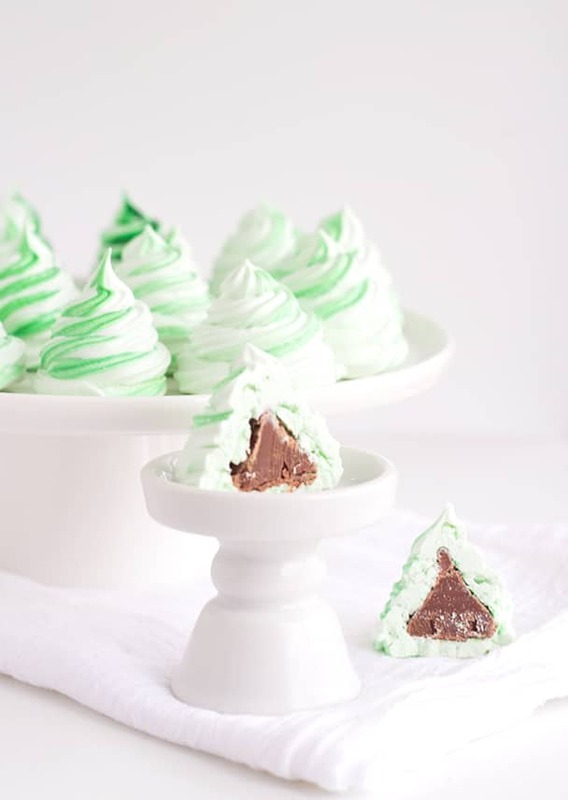 Continue to pipe the meringue up around the chocolate kiss to make it look like a christmas tree. The dark green will start to come through. Place in the oven to dry for 2 hours. You'll have to do the same with a second pan and place it on the bottom rack. Remove from the parchment paper and serve! 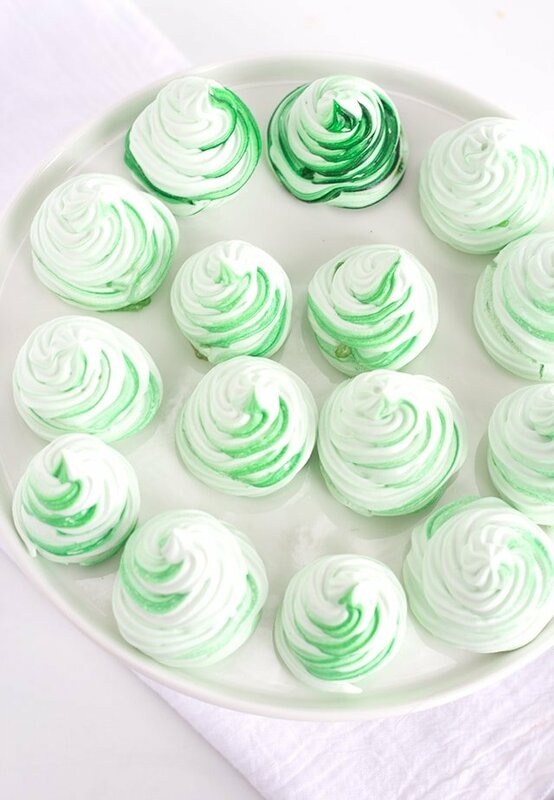 What cute little meringues! 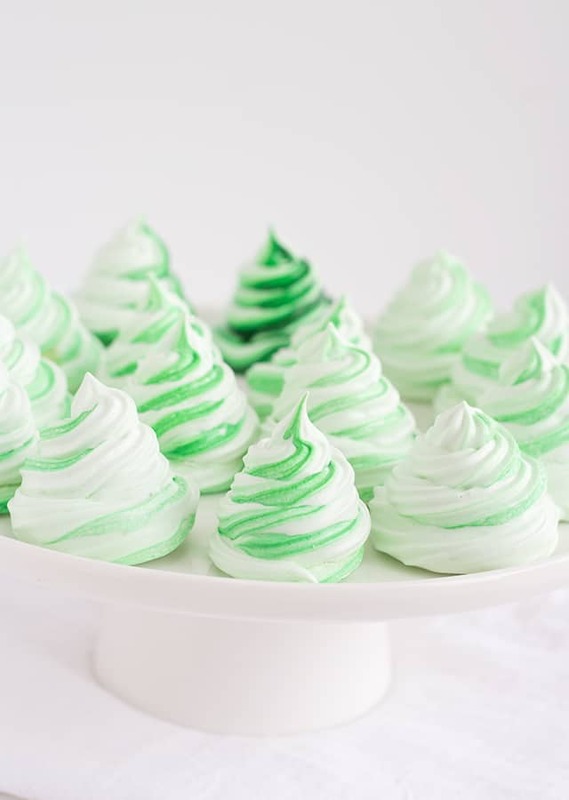 They look just like tiny Christmas trees 😛 Love the mint flavor in here too! Tried this.. It fell as soon as I put extract in and never stiffened.